Great place the stay in Chaoun! Good facilities, and a great view from the terasse. The hostel is a bit of a walk (15 mins or so) from the Medina, but I found it to be really nice in a quieter location. The hosts treat you like family,and as a bonus, they have a pair of friendly and cute dogs. Definitely recommend. Such a lovely place with great people, will definitely be coming back! 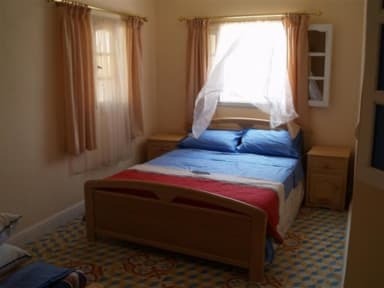 It has good facilities and a nice location just out of the medina. The terrace also has the most amazing mountainous view, and the two friendly dogs make it even better. 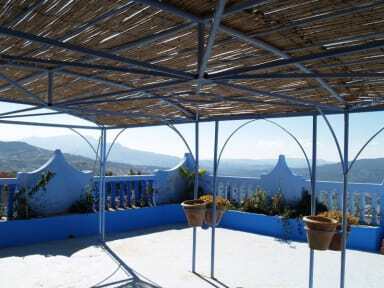 The most amazing place to stay in Chefchaouen! Extremely friendly and hospitable hosts with wonderful dogs. Clean and cool rooms. Beautiful terrace with a great view overlooking town. Peaceful atmosphere. I cannot recommend Dar Scotlandee enough! Dar Scotlandee is in an awesome location above the main city. The walk allows you to see views that you otherwise might miss. The owners are incredibly sweet and flexible with your needs as they know most people have traveled a long way to get there. They provided us with a delicious breakfast complete with local honey and gave us a great recommendation for a local hike. Oh and their dogs are adorable! I would definitely stay here again! Located a taxi ride away from the Medina. Easy to walk down and easy to get a taxi back up. We were given great travel advice and suggestions on where to go. Akchour is not to be missed if visiting Chefchouaen. We were given directions on how go get there and the route to take to reach the best spots along the river. Very accomodating family with great breakfast too!!! We had a great stay at Dar Scotlandee - a little like a home away from home. Terry and Suzanne are exceedingly warm and friendly and welcomed us to their home, not least with a cup of English (or Scottish) breakfast tea to remind us of ours! There was a great atmosphere in the Dar and we met some lovely people. We had a few issues with the shower, but this was only temporary. All in all, a great atmosphere made by very friendly hosts. Thanks very much Terry and Suzanne! The hosts were friendly and helpful, and Dar Scotlandee has an amazing rooftop terrace overlooking Chefchauouen. However it's a 30 min uphill walk from Medina and you'll be paying European prices for breakfast and laundry. There aren't any other food / going out options nearby, but Dar Scotlandee is perfect for a quiet retreat.